Église Notre-Dame de l’Assomption in Mont-devant-Sassey. 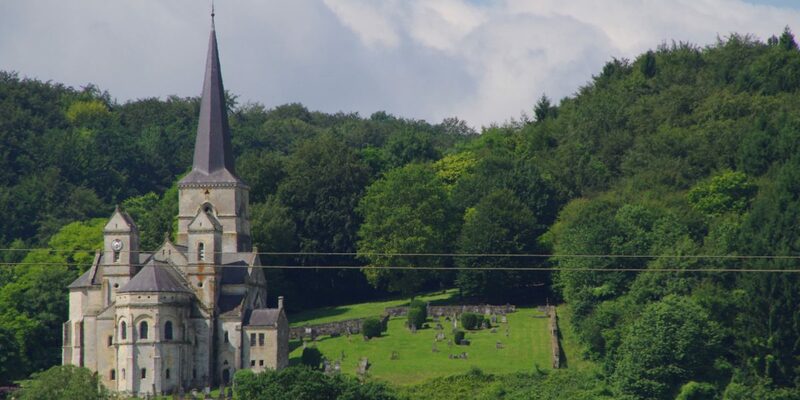 Built in the Argonne foothills during the 11th and 12th centuries, the Church of Our Lady of MONT-DEVANT-SASSEY is one of the most beautiful religious buildings in Lorraine. Despite lengthy periods of construction, wars and plundering, it has maintained its architectural integrity and sober elegance. It houses treasures of Roman and Gothic architecture and sculpture : the choir and 12th century open crypt are remarkable. The late 12th century nave has been completely restored and the 13th century carved portal is the oldest and best preserved in Lorraine. This was a dependent of the chapter of the noble ladies of Andenne Belgium, from a very ancient time, the 7h century at least. 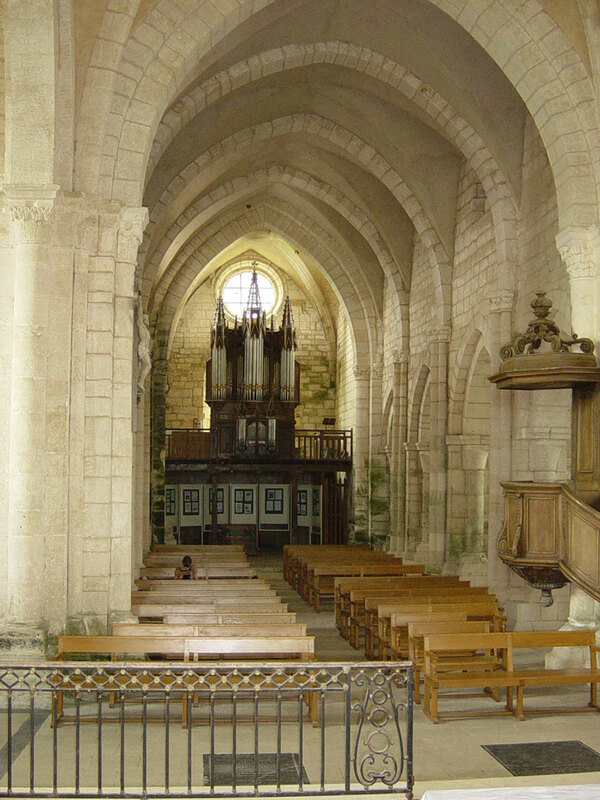 The church, which is one of the finest in the Verdun region, was built at the end of the 12th century. The apse, the very wide choir, the transept some walls of the nave date from this period. The nave itself has four spans and the aisles were finished in the 13th century. The gateway on the south aisle and the two towers of the chevet were added then. The bell tower porch dates from the 14th century. In the 17″ Century, the church was put on a defensive footing and withstood a siege from which it emerged in a very damaged state. lt was necessary to reconstruct the vaults of the nave first, and then, in 1754, the porch. Restored in 1869, it was repaired again in 1928. Under the choir and the apse there is a crypt worthy of note with three naves, the Roman columns of which are decorated with wide-open capitals, which reminiscent of those of Verdun cathedral. The gateway has kept its statuary, although unfortunately they are very damaged. 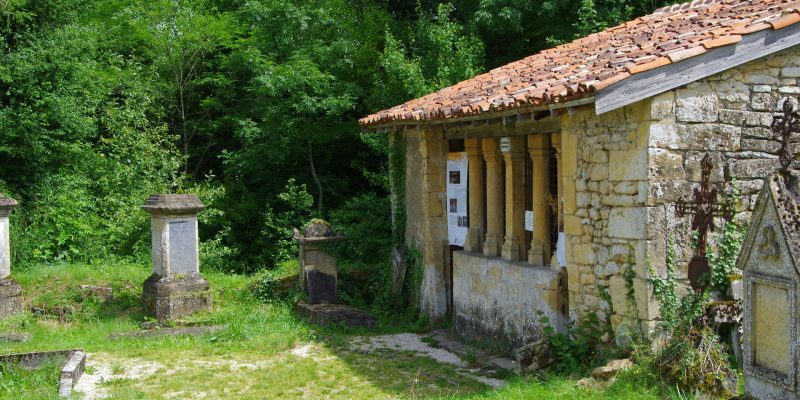 The Virgin to whom the church was dedicated has disappear but figures from the Old and New Testament still exist. The Nativ occupies tke lintel. On the tympanum can be seen scenes recounting childhood of Christ, the Apostles, etc. MAY, JUNE and SEPTEMBER: weekends and holidays from 15.00 to 18.00. JULY and AUGUST: daily from 15.00 to 19.00.